Accsys Framework Series: Sage CRM a New Look! Welcome to our new series on the Accsys Framework. This is a new add on product that is currently in development by Accsys Consulting and we are giving you a sneak peak on what is coming up. Sage CRM is a tool that can enhance an organizations business processes by handling the menial and tedious tasks that is necessary for a business to run smoothly by getting the data in order and organised. Accsys Consulting views Sage CRM as one of the most flexible business applications available in the market. This flexibility allows a business to customize Sage CRM to fit the needs of the organisation. One of the key advantages that Sage CRM has is the extensibility of the application, allowing businesses to do what they do best without having to change to fit the capabilities of the application. Technically – extensibility is a system design principle where the system is made to grow and designed so that other components can added on to increase functionality. But if you’re a business partner like us, then you already know that Sage CRM can do that already and that this is nothing new. You can customize Sage CRM by adding new entities, new .asp pages to suit your needs, you can even have CSS to give it a fresher look, use different plugins and many other customization techniques. Accsys Consulting has decided to take it a step further. But before I go on with this ‘next step’ let me say why Accsys Consulting decided that we wanted to go down this path. It started as an idea to improve the UI in general of Sage CRM, to make it more up to date on the programming side of the spectrum we wanted to make use of HTML5, to allow business partners to deploy customisations quicker, easier, with more flexibility. In addition to improving the customization component, we were also aiming to improve the end user experience by speeding up data entry and making it as intuitive as possible. The Framework isn’t a replacement for Sage CRM, instead we see it as an enhancement that builds on an award winning application by adding additional functionality. Our key goal is to provide a system that provides speed, scalability, and usability while taking advantage of the powerful features provided by Sage CRM. Just to get you started, here is a taste of some of the features that we have implemented so far. We started with the login screen and made it possible to customize it so that the client can customize it to make it fit their needs. This is possible through the current login page, however we wanted to be able to add new features such as a new s feed for the organization. The first entity we put through the framework was Case Management. We needed this internally to help manage our own clients. We had attempted this a few occasions before, however we did have user adoption issues. When developing the case management screens our approach was to ask the technical consultants what they needed and designed the screens around these requirements. The result was a simple to use interface with as much information as possible on the same screen. In comparison with Sage CRM we have migrated a lot of the standard features to our framework, but added some little touches on the way through. 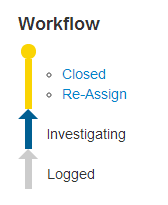 For example, the workflow now shows where you have been and where you can go from the current state.